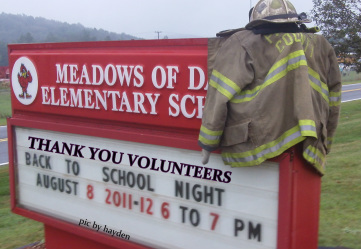 We are saddened by the loss of our Historic Meadows of Dan Elementary School. The School building was severely damaged by fire on the morning of August 13th, 2011. All Patrick County local Volunteer Fire Fighter Squads responded promptly when the call came in the early morning hours Saturday. They were assisted by several Squads from neighboring Counties and Towns. Upon arrival they found the fire was well established in second story roof area. They put forth their best effort to save the School building and surrounding structures, pumping thousands of gallons of water on the buildings. At the end of the Day, we were blessed that no one was hurt fighting the fire or in the School. The main structure suffered severe damage with the roof collapse along with the second floor. The Kitchen area and newly constructed Gymnasium was saved from major damage thanks to the efforts of over 17 Squads of Volunteer Fire Fighters. Our heart felt thanks to the Volunteer Firefighters whom went above and beyond the call of duty to save the buildings, County Sheriffs Office directing the heavy flow of tanker and pump trucks that had to travel offsite for water, EMS Personnel, and Meadows of Dan Community support volunteers that were there quickly to provide water and food to the Firefighters. Now we have the monumental task of providing a temporary School and planning for the future of our School in Meadows of Dan. The Patrick County Board of Supervisors along with the Patrick County School Board meet Saturday afternoon and started the planning for a temporary school in Meadows of Dan. We will all work together, School Board, Board of Supervisors along with the citizens of Patrick to provide good safe permanent educational facilities in Meadows of Dan.